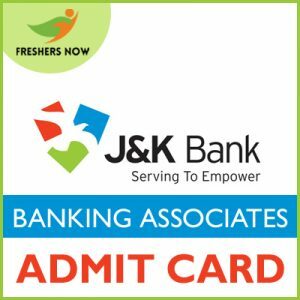 JK Bank Banking Associates Admit Card 2019 is Available Now: The officials of the Jammu And Kashmir Bank had noticed that the JK Bank Banking Associates Exam is postponed on their official site. So, candidates who are ready to attempt the JK Bank Examination on 24th, 25th & 26th April 2019 must and should download the call letter from 14th April 2019. Furthermore, we have also inserted the direct link to download the JK Bank Banking Associates Hall Ticket 2019 and the steps to follow, the latest JK Bank Banking Associates Selection Process 2019, the scheduled JK Bank Banking Associates Exam Date 2019. So, observe the entire page to get the latest stuff. 1.7 How To Download JK Bank Banking Associates Hall Ticket 2019? The officials of the Jammu And Kashmir Bank had published to conduct the JK Bank Banking Associates Selection Process 2019 for only two rounds. And those are listed below. So, before going to start preparation, first, look at this section and then move further. जम्मू और कश्मीर बैंक officials will conduct the Banking Associates examination only for the candidates who have applied for the examination. 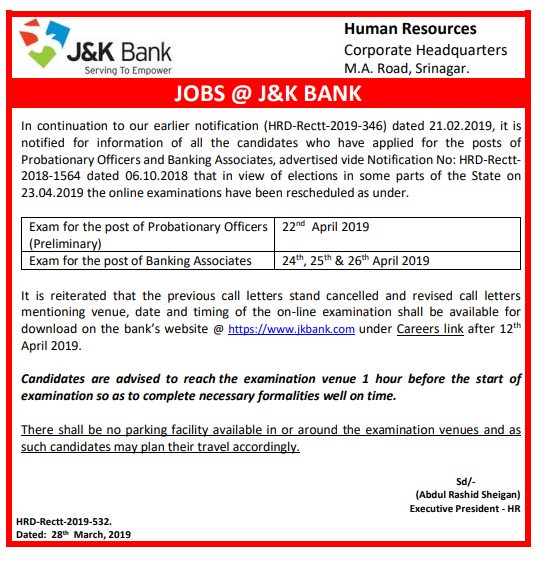 JK Bank Banking Associates Online Examination which was postponed has now been re-scheduled on 24th, 25th & 26th April 2019. So, all you need to be attentive to know the clear data available on the current page. Candidates should bring the printout of their JK Bank Banking Associates Admit Card 2019 in the examination hall. How To Download JK Bank Banking Associates Hall Ticket 2019? Navigate to the official site of the Jammu And Kashmir Bank @ jkbank.com. Now the official home page will be displayed on the screen. Observe the Careers section on the top of the home page. Then, you will be redirected to the new tab. On that page, you can observe the Jobs segment on the window. Then, you will enter into the new tab. There, all the candidates need to enter the accurate credentials like the Registration No/ Roll No, Password/ DOB (DD-MM-YY) and then enter the recaptcha code. Submit the page by clicking on the Login Button. Furthermore, you need to check the details present on the available JK Bank Banking Associates Admit Card 2019. So, for any updates regarding the JK Bank Banking Associates Admit Card 2019, you can get into our site @ FreshersNow.Com.